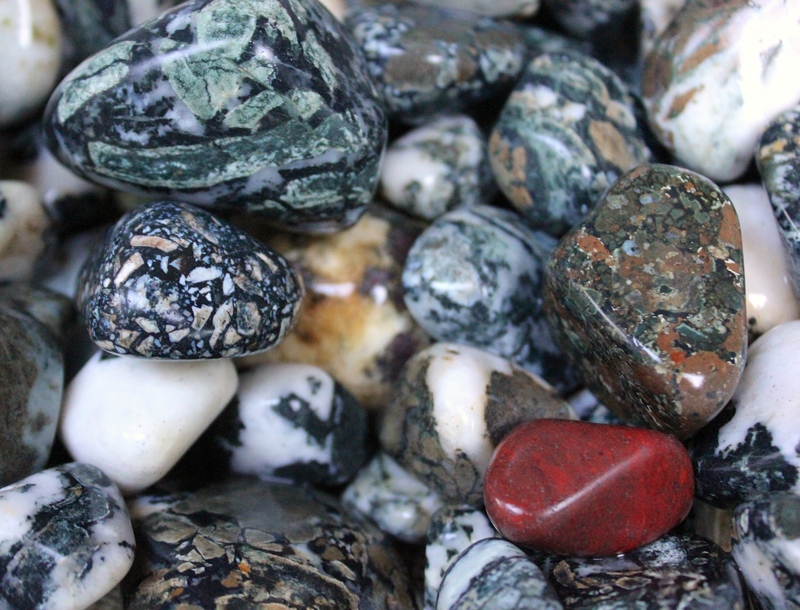 The difference between agate, jasper, chalcedony and chert is one of the biggest stumbling blocks for people getting into the hobby of rockhounding or mineral collecting. I know because I was tripping over it for months, and I’ve seen other people struggle with it as well. The truth is, even the best rock identifiers can’t always be sure. That’s the thing about rocks – they’re a bunch of stuff mixed together. The same rock could have agate banding with a jasper body and druzy quartz cavities. Let’s start with the generic ones. Chalcedony is a broad term that covers both agates and jaspers. It is often associated with blue and it usually means microcrystalline quartz of a high gem-like quality. People usually use the agate and jasper terminology over chalcedony but it is sometimes used to describe mono-coloured gem-quality material. Chert is also a variety of chalcedony. It is used often to describe unnamed bland jasper. – Both break with conchoidal fracture with a non-granular texture and vitreous or waxy lustre. Here’s an agate: the banding gives it away. As mentioned above, agates and jaspers are both under the umbrella of chalcedony, but they are used more specifically along with trade and location names to identify specimens (Mossy Agate is a trade named based on how it looks; Dallasite is named after the road it was found on). Agates are usually translucent to transparent when cut in a thin slice, while jasper is usually opaque. Agates often have distinct banding formations (sometimes looking like “fortifications”) or mossy, dendritic and plume inclusions, while jaspers are more likely to be brecciated (sharp chunks of rock in a matrix) or display a picture or some other type of design. Here’s a pile of jasper, mostly Dallasite and some red, from Vancouver Island. Sharp patterns, but not the same banding. The primary things to look for when rockhounding for an agate is for it to be translucent, microcrystalline and have bands, orbs or other inclusions. Jaspers will often be brecciated and opaque, microcrystalline and usually with interesting designs. If you can see crystals or easily scratch it, it’s not an agate or jasper. ← Setting the tumblers, need more! So very interesting. As a little girl, I remember walking the beach in Nova Scotia with my father and picking up rocks. We were looking for agates which were somewhat plentiful in that area but still a little challenging to find. I recall feeling convinced that I knew an agate when I found one but then every pretty rock was an agate when I was young. Although I still think I had some expertise to discern…but perhaps may have confused a jasper or two as an agate. Can jasper also be found in Nova Scotia? A lot of people just write “agate and jasper” to describe what they find because, as rocks, they often blend into each other and strict definitions are hard. I bet you picked up some great rocks when you were there. Very few people realize how many cool rocks are all around us. There’s a great Wyoming gemologist blog (in my Useful Links section) about how the state wasn’t known for much beyond nephrite before he started finding gems all over the place, including large opal deposits just on the side of the highway. For every seemingly rare and amazing rock out there, there’s a guy with a backyard full of it. I refuse to believe there’s a spot on the planet without a cool and original rock. What trips people up sometimes is not realizing how different rocks look from rough to cut and polished. A lot of the most amazing polished, slabbed, cabbed and tumbled stones didn’t look like much on the ground. Some rocks, like rhodonite, develop weathering on the outside that totally obscures the colours and designs underneath. You have a much easier time identifying a polished rock than a rough one. I’m sure anyone could collect local rocks and be quite pleased after tumbling them! This is a great layman’s explanation! I’m just jealous that you can find all that on the ground where you are. Thanks! I bet agates and jaspers are all around you too, somewhere. Rivers, lakes, shores are the easiest to hound. 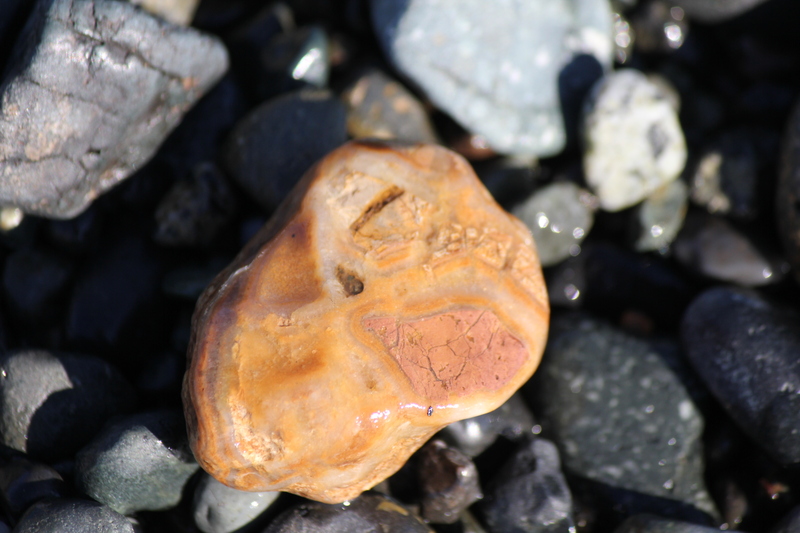 The jasper that I’am finding on Denman and Hornby island are different…mustard yellow, deep reds and greens. The normal dallasites are ubiquitous here as well. The “different ” jaspers are found within the conglomerate formations on both islands. Anyone researched these formations for this material and if it is rare? I would LOVE to see a flow chart of all these… Chalcedony encompasses all of them, and jasper is chert/flint, but is agate also a chert? Still confused on the taxonomy/hierarchy here. Perhaps definitions for each would help (micro-crystalline quartz-derived sedimentary with Moh’s 7), or perhaps the names are just a human-perceived nuance.